This post is sponsored by Marshall’s. Thank you for supporting the brands that make this little blog possible! Well believe it or not, we’re already almost two weeks into a brand new school year over here. Crazy, right?! I know many of you are still enjoying summer break (you lucky ducks!) but we are in full blown school mode. And I have to admit–even though I wasn’t excited about school starting up again, it is kinda nice to be back into a regular routine–emphasis on kinda. We are slowly but surely getting into the swing of things again with our schedule and it’s actually been an easier transition that I thought it would be. 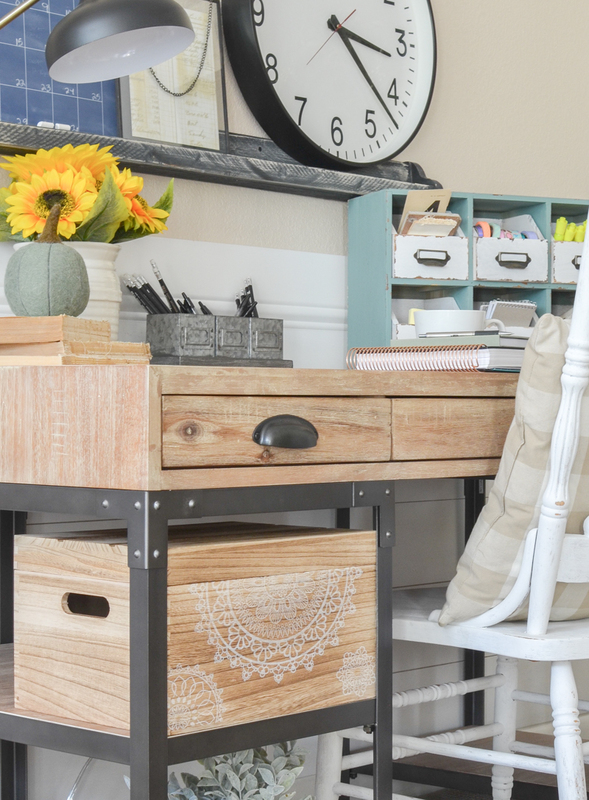 And now that school is back in session and fall is just around the corner, I’ve been on a mission lately to get the house a bit more organized and put together for the new year. 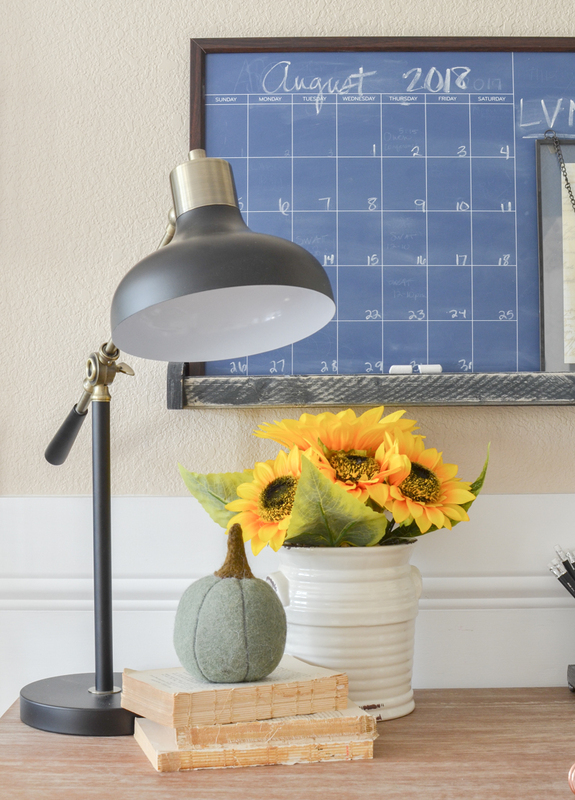 I recently did some organizing in my office area, so I’m excited to show you how my desk is looking for fall. I partnered with Marshall’s again for today’s post and I can’t wait to share what goodies I found there this time! With the open shelf design of my desk, I’m definitely a bit limited on drawer space. So I’ve been wanting to get some bins that would give the storage of a full size drawer, while still being cute at the same time. I was so surprised to find these lightweight wooden bins at Marshall’s that basically match my desk perfectly. I mean, don’t they look like they belong together?! The grain of the wood is almost identical, but I love how these bins also have the detailing on the side. They make perfect storage because I can just load them up with whatever I need, pop the lid on, and everything looks organized and tidy. You guys know by now that I love going to Marshall’s for all my faux greenery–it’s been my go-to place for years and years. But it’s also a great place to shop for seasonal decor. When I dropped by there a few weeks ago they already had lots of cute fall decor out, including tons of signs, pumpkins, and wreaths. I picked up this small pumpkin and the sunflowers for my desk just to give this area a little touch of fall. And I know I’m a bit early here, but I just can’t help it. Fall decor is so fun! Even though I don’t have the biggest or fanciest office area, this has been such a great space for me. As a work at home/stay at home mama, it’s difficult to feel organized and put together some days, so it’s really nice to have my own little corner to work. I’ve actually been using it a ton lately, especially now that we’re back into the swing of our school schedule and normal routine. 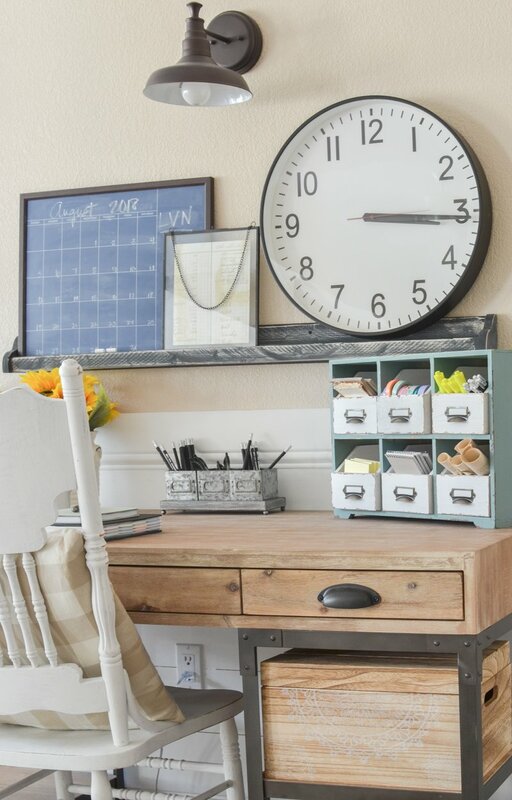 And I gotta say, it’s been awesome to have more organization and storage in here–especially those wooden bins and that adorable farmhouse style cubby with all the drawers for my office supplies. I looooove it. Anyway, I hope you enjoyed seeing how I’ve organized my desk for fall. 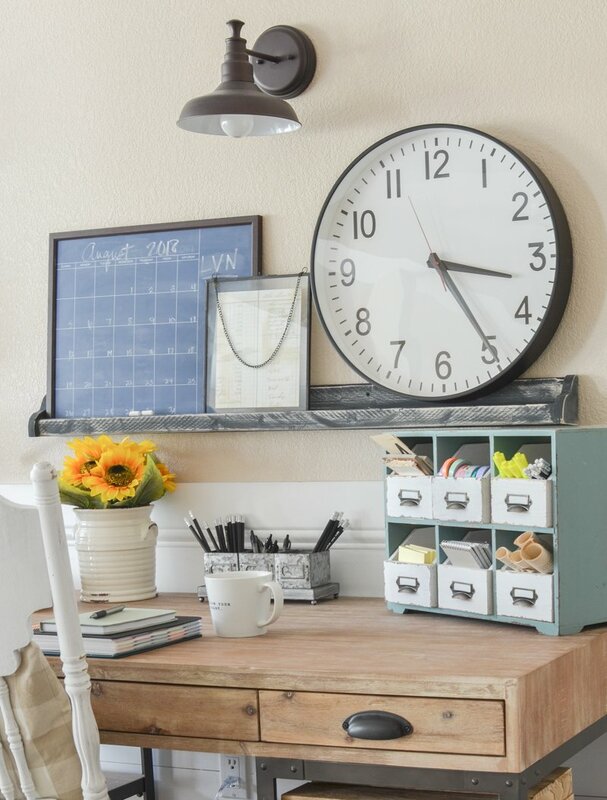 Marshall’s is a great place to shop if you’re looking to update your work space the new school year too–plus you can snag some awesome fall decor at amazing prices while you’re there! an office space for myself, which I’ve never had before. Love your blog! i’d LOVE the desk purchasing details as well! 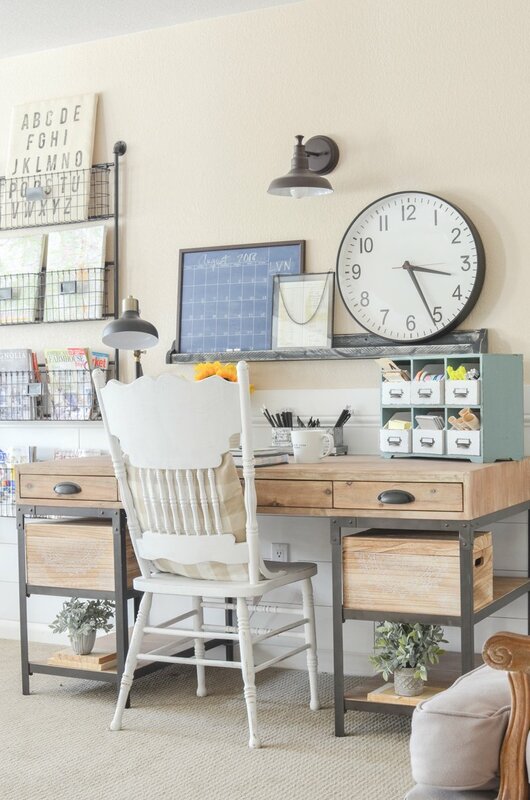 love the entire office area! beautiful! Ok now you’ve got my curiosity going! 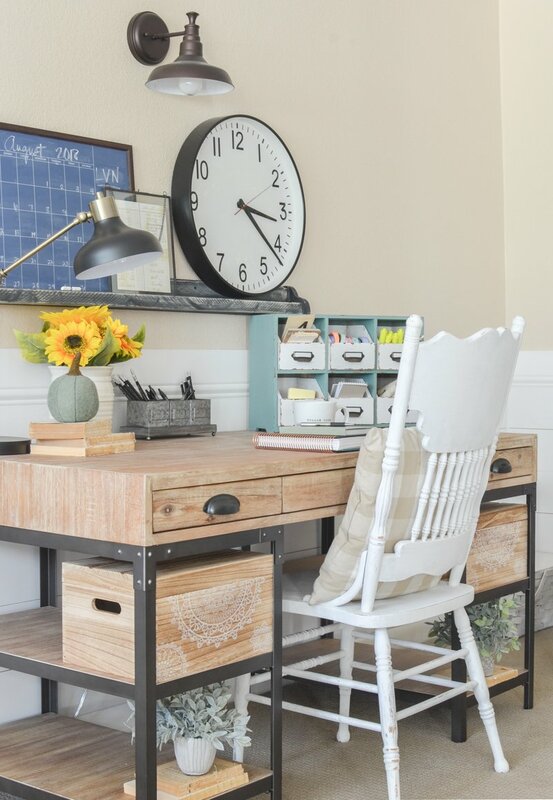 First off…I love the desk and everything surrounding it! 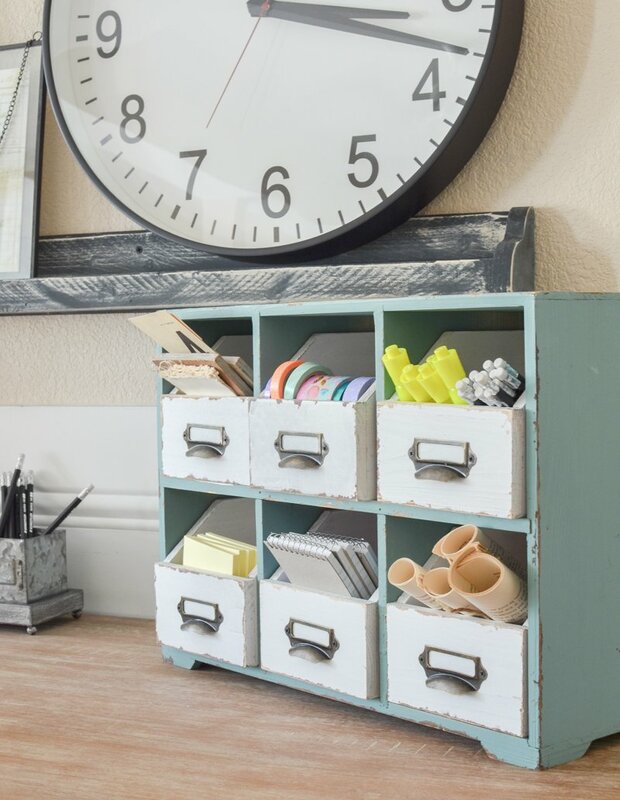 Where did you get the 6 drawer organizer on top? It’s awesome! Also I see a chair in the last picture with an unfinished piece next to it. Could you please elaborate as to what that is? Thank you! That cubby is from Marshalls! And that unfinished piece is actually an old crate that I made into a side table. Aw thank you! I have actually never been to Marshall’s. We have one right here in town and one not too far from here but just never had the urge to stop in. I guess I will be now…lol. I use crates a lot but not solid ones like this. Great idea! I will have to find or make some solid ones for a few things…everything looks so nice! Hi I love that wire rack you have on the wall. Where can I get one? 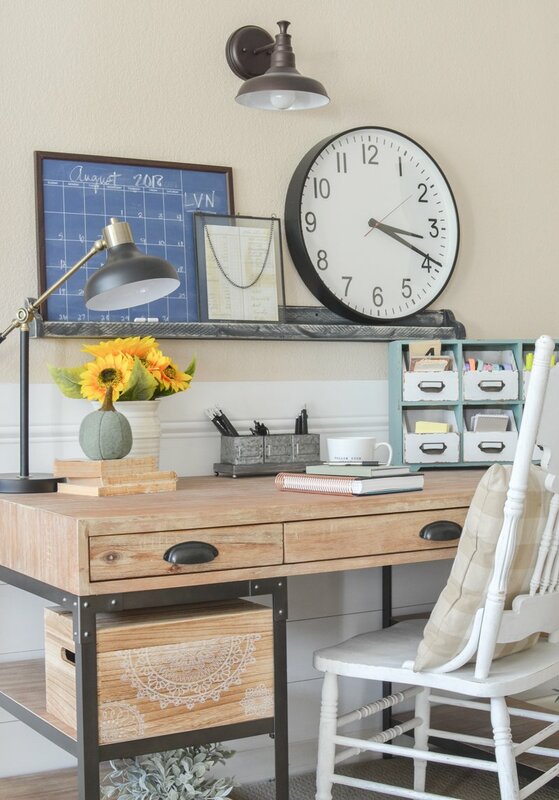 I honestly thought those wooden boxes were part of the desk! They really match it perfectly and fit so well there! Great finds! Right?! They’re such a perfect match. Like they were meant to be together! Sarah, when you put “together” something it really does come together! Great job, looks like a well loved work area! aw thank you Laura, I appreciate that!! 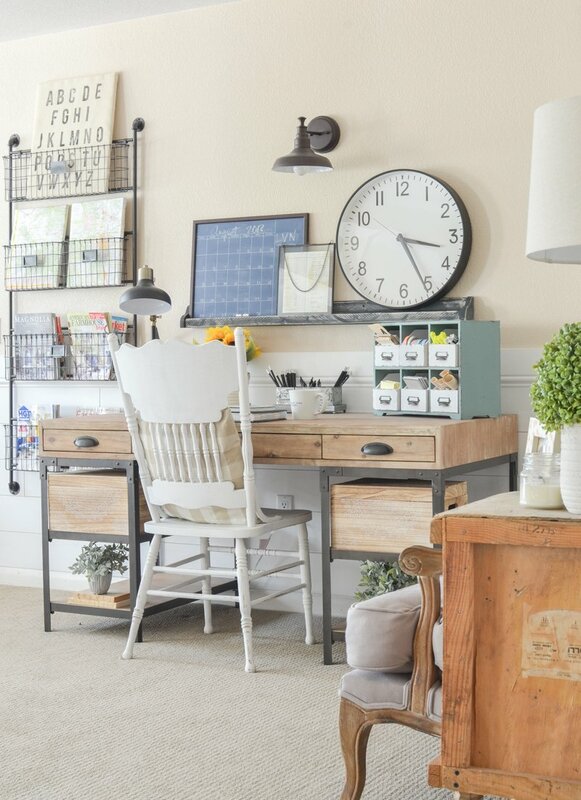 This gives me a ton of ideas for my home workspace. Thanks so much!! Of course, thanks for stopping by Carol!! Just love it. Well done and girl I love, Love Marshall’s. It’s one of my favorite stores. Love Marshall’s!! I always find the cutest things there ! Love your post! It inspires me for fall! Starting to get out some of my fall stuff ! I need to run to Marshall’s too!! Looks Great! Thanks for sharing. I as well already have a few Fall items out, it is my favorite time of year! It’s definitely a fun season to decorate for! Where is the abc hanging from? Thanks!! I made it! It was a super simple DIY project.